This cot side toy has 2 sides of colors to enthrall newborn babies as well as elder ones. The black & white contrasting colors side will develop younger babies' vision whilst the full color on the reverse will attract older ones. 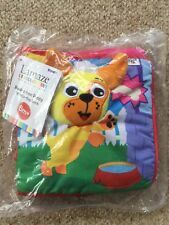 Lamaze Spin Rattle & Go Toy Bar. Keep your baby busy while you're on long car rides with the Lamaze Spin Rattle & Go Toy Bar! Spinning Rattle with Colourful Beads. Spinning Bug on a Swing. This toy bar will surely entertain your little one and can be a great baby shower gift to friends and family! Excellent condition Pick up Engadine NSW 2233 or can mail and combine postage Check out all my other kids clothes and toys for sale! Babies will be kept amused and entertained with s o many colours, patterns and textures to stimulate the senses. All toys have been cleaned. Pre-loved baby toys, in good conditions. No pets and non-smoking household. Lamaze Baby Yo Ho Horace Discovery BookModel No: LC27915. The "Yo Ho Horace" Discovery Soft Book by Lamaze is filled with exciting things for your little one to discover. Squeaker parrot. 10 different textures to explore. Lamaze musical flowers. 1 set - Quercetti Daisy Maxi Stacking Peg Set Made in Italy. 1x Stacking set. 1 x V-tech play Phone. Pick up from Carrum preferred. All items in excellent, clean and working condition. Quality brands mostly Fisher Price and Playgro in this lot. Lamaze Stroll & Go Fun. Keep your baby busy while in the stroller or high chair with this Lamaze Stroll & Go Fun! Designed with animals which are the Spin & Rattle Monkey, Busy Bee Bird and Snack Cup Elephant. Baby will love his bark and delight in discovering other fun squeaks, crinkles, and rattles. The added link makes him easy to take along anywhere, and the bright colours are visually appealing. Suitable for children from birth. Touch : Clinking rings and a spinning starfish help develop baby's pincer grip. Move : Eight floppy legs encourage pulling, squeezing, and hugging, strengthening muscles. Babies & Kid's. Lamaze Play & Grow Dee Dee the Dragon. Bulk Lot/ Bundle of Baby Toys - Rattles, Teething Rings/ Links, Squeak & Soft Toys for Birth & Up. Teething Rings/ Links (20 assorted colour & textures). Mallory Grant "Rose" Bunny Squeak/ Soft Toy. · Polyester fibre. · Soft lift the flap book. Pick up from Daisy Hill, QLD (near IKEA). Prefer cash on collection. · Great for younger kids to work on fine motor skills. Lamaze octopus. Noise / music when legs are pressed. Excellent condition. Near new. Smells like vanilla. Smoke and pet free home. Pick up near Wooloongabba. Will post at buyers expense. · Polyester fiber. · Bright colors, different textures, and crinkles awaken baby’s senses. · Soft page feature friendly characters. Thomas, Big Block , Fire Engine , Kids Toys Big Bundle, Great Value! Big bundle of beautiful toys including Thomas, Big blacks, Fire Engine, and more ! It can keep kids entertained for hours and they can practice on stacking, pushing, looking, turning, making noises, and babies love those ! Keep baby entertained at the dinner table with the Freddie the Firefly Highchair Toy. Your baby will be entertained by Freddie's spinning ball, knobbly rings, crinkle wings, and chunky beads which slide around colorful teething wings. L It includes 8 colorful pages for your little one to explore. When unfolded, the soft play mat encourages baby to move forward and reach, push and crawl. Pierre features a unique folding design that makes him the perfect size to take him with you on the go. Soft book and blanket in one. Lamaze Monkey LinksModel No: L27177. These funny little monkeys are great to place across a car seat or stroller when you are on-the-go. Babies will be fascinated by the bright colors and different textures she can reach for and feel. Great for younger kids to work on fine motor skills. Great therapy book as well. All kids love this one! Polyester fibre. Young babies love putting shapes in and taking them out. Featuring three ways to play; put in and take out play, shape sorting and color matching. Crinkle, rattle, jingle and squeaker awaken auditory awareness. The hungry caterpillar book mobile. Hanging horse with knight by Lamaze. Clip clip toy by play gro. Teddy by Bruin. Excellent condition. Great to keep little one entertained. Lamaze Baby Bath Book Yo Ho HoraceModel No: LC27505. Yo Ho Horace Bath Book. Waterproof pages. Bathroom Essentials. Babies & Kid's. Appliances & Whitegoods. SKU: LC27505. KG Electronic Pty Ltd.
Lamaze Baby Bath Book My Friend Emily. My Friend Emily Bath Book. Waterproof pages. Sports & Fitness. · Polyester fibre. This soft, lift-the-flap book is full of surprises for baby, who learns about the animals on a farm and the noises they make. · Soft lift the flap book. · Great for younger kids to work on fine motor skills. [Squeeze the nose to hear a fun song. Textures and sounds encourage exploration, while bright colors promote visual stimulation. Squeeze the nose to hear a fun song! ]]>. Lamaze Torin the T-Rex Hide & Seek Soft BookModel No: LC27918. Lamaze Torin the T-Rex Hide and Seek Book is an interactive soft book that allows your little explorer to discover and play with cute dinosaurs. Lamaze Bella the Bunny Hide and Seek Book - 6m . Lamaze Bella the Bunny Hide and Seek Book is an interactive soft book that allows your little explorer to discover and play with the cute bunny. Each page features a soft cloth book with a cute bunny. Where's My Fire' the Lamaze Flip Flap Dragon soft book! Featuring Lamaze favorites Flip Flap Dragon and Freddie the Firefly is full of surprises for baby to explore! Lamaze Flip Flop Dragon Reading "Where's My Fire" Soft BookModel No: LC27839. This toy snake is in excellent condition with no signs of use. Lamaze Olly Oinker Goes to the Park Soft Book. Introducing Lamaze Olly Oinker Goes to the Park Soft Book! Very interactive because of its bright colours, textures with soft features where your little ones can easily flap each page of the book. Mr. Incredible has crinkly arms and legs that make grabbing and squeezing more fun. Baby can discover multiple textures and a teether ring with 3 colorful beads, perfect for helping develop tactile skills. These funny little monkeys are great to place across a car seat or stroller when you are on-the-go. Babies will be fascinated by the bright colors and different textures she can reach for and feel. The monkeys have patterned, crinkly feet and soft multi-colored satin ribbons for hair. The Lamaze Activity Spiral brings colourful fun to baby ÃƒÂƒÃ‚ÂƒÃƒÂ‚Ã‚ÂƒÃƒÂƒÃ‚Â‚ÃƒÂ‚Ã‚Â‚ÃƒÂƒÃ‚ÂƒÃƒÂ‚Ã‚Â‚ÃƒÂƒÃ‚Â‚ÃƒÂ‚Ã‚Â– whether in the cot or on the go. Simply loop the soft spiral around your cot or on the stroller to engage baby. By: Lamaze | sku: L27253. includes a multi-purpose clip, designed to clip on to strollers or diaper bags so Edna can travel everywhere with you. By: Lamaze | sku: L27254. listen to him make fun growling sounds as you turn him side to side. Baby can explore to find surprise crinkles and chew on the tethered leaf-shaped teether. Raccoon also has high contrast patterns and multiple bright colours, adding visual stimulation for baby as they play. By: Lamaze | sku: L27251. Baby can pull Mrs Incredible’ s arms back and forth, helping to develop motor skills. the star-shaped teether is great for chewing, while the bright colours, contrast patterns, and multiple textures encourage baby to explore. The Lamaze Activity Spiral attaches to car seats, carrier bars, strollers and cribs for on-the-go play for baby. TheLamaze Activity Spiral attaches to car seats, carrier bars, strollers and cribs for on-the-go play for baby. By: Lamaze | sku: L27252. Mr Incredible has crinkly arms and legs that make grabbing and squeezing more fun. Baby can discover multiple textures and a teether ring with 3 colourful beads, perfect for helping develop tactile skills.